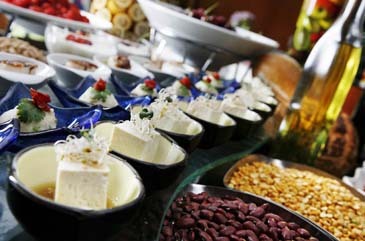 Imagine being able to indulge yourself in a buffet that featured five of the world's healthiest foods all at once? Come to the COEX InterContinental Seoul's The Brasserie, located on the hotel's Lobby level, for menu items featuring kimchi, tofu, yoghurt, lentils and olive oil from July 3 to the end of August—-just when you need that extra nutrition to get you through the hot summer months. For salad lovers we're featuring 14 different varieties—all made fresh vegetables and marinated with olive oil. Try Greek-style yoghurt dressing and meat yogurt sauce as well as sweet and refreshing yoghurt gelato. In addition to our normal menu selection of over 150 items, during this promotion don't forget to try lentil and chickpea soup or tofu salad. While our emphasis is on our well being salads don't forget to try one (or more!) freshly baked healthy herbal breads. Korea's internationally famous traditional side dish, kimchi, will be available in a variety of variations and also prepared in ten different dishes.